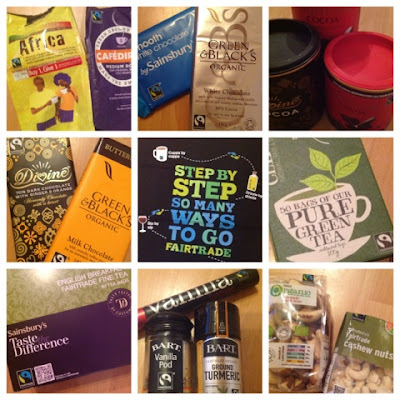 We're over half way through #fairtradefortnight which this year runs from 25th February to 10th March. I do try to use Fair Trade ingredients when I can but events such as these serve as a timely reminder. As do my children. Both boy and girl have undertaken projects on Fair Trade at school and keep me in check with eagle eyes to seek out the Fair Trade logo in the supermarket. Woe betide me if I buy the wrong bananas. I was delighted to receive a goodie bag of products from the Fairtrade Foundation and have thoroughly enjoyed, cooking, eating, drinking and baking with them. Alas there was no Fair Trade wine in my parcel but I've been thoroughly enjoying my Fair Trade morning cuppa over the past week. Stir in the stem ginger, syrup, oats, ground ginger and chocolate and mix until combined. Press into a greased and lined tin. Bake for 25 minutes and cool in the tin before slicing. I took the flapjacks along to a course I was attending and they were quickly decimated. Would also be really tasty with some Fairtrade raisins or sultanas stirred through. Next I had to come up with a Fairtrade recipe that a class of twenty eight Primary 4's could bake. I opted for muffins. Mix together all the dry ingredients on one bowl ensuring you sieve all bar the oats. In another bowl mash the bananas, add the egg, milk, oil, vanilla and mix well. Pour all wet ingredients in to dry and stir until combined. Spoon into 12 muffin tins/cases. The kids seemed to thoroughly enjoy baking and were very enthused by the end result coming up with the slogan - All Made by Fair Trade. I'll be back at School later on this week to help judge a Fair Trade Bake Off. Can't wait to see (and taste!) all the Fair Trade cakes and bakes on offer. Fingers crossed that two very special judges can also put in a guest appearance. My lips are sealed. Thanks Elizabeth - I can confirm that they were. Particularly the flapjacks. Happy to advise that the guests arrived in the post right on time! ooh I like the flapjacks, may have to make these this weekend. They were very good. The stem ginger and syrup is a great addition if I say so myself! I'm impressed with your Fairtrade shopping - it's rarely something I think about, though I know I should! Where I teach, the only tuck shop the school has is Fairtrade and it does really good business. Sets a great example to the young people too. Interestingly I find it more difficult to shop Fairtrade when I do my grocery shop online as its not always highlighted. Much easier in person to spot the logo and make a good choice. There are some fantastic fairtrade tuck shop items out there.